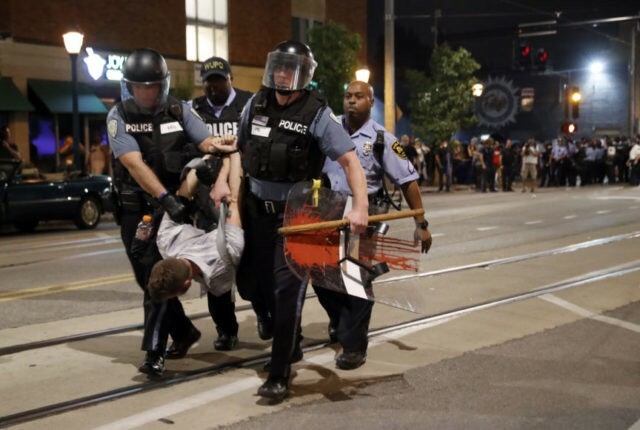 ST. LOUIS (AP) — Protests turned violent for second night near St. Louis following the acquittal of a white former police officer in the fatal shooting of a black man, as a small group of demonstrators refused to disperse, breaking windows at dozens of businesses and throwing objects at police, who moved in with hundreds of officers in riot gear to make arrests. The confrontation took place late Saturday night in the Delmar Loop area of University City, a suburb about 10 miles (16 kilometers) west of St. Louis near Washington University. The area is known for concert venues, restaurants, shops and bars and includes the Blueberry Hill club where rock legend Chuck Berry played for many years. University City had been the scene of a tense but calm march earlier in the evening to protest a judge’s ruling Friday clearing ex-officer Jason Stockley of first-degree murder in the 2011 shooting of 24-year-old Anthony Lamar Smith. That march ended with organizers calling for people to leave and reconvene Sunday afternoon. But a few dozen protesters refused to go. Police ordered them to disperse, saying the protest was unlawful. Hundreds of police in riot gear eventually moved in with armored vehicles. The demonstrators retreated down a street, breaking windows with trash cans and throwing objects at police. Several protesters were seen in handcuffs, and city and county police later tweeted that they had arrested at least nine people. Police were seen carrying one handcuffed man away from the scene upside down. At least one demonstrator was treated after he was hit with pepper spray. After the spasm of violence ended, a reporter for The Associated Press found at least half of the businesses on one side of the street with broken windows along a two block area. Sam Thomas, who was helping his friend clean up the glass from the shattered windows of his business, OSO, a clothing and accessories boutique, said he understood why people were angry. The U.S. justice system is broken and needs to be fixed, Thomas said. “I’m not saying this is the right way to fix it,” he said of the damage. On Friday night, nearly three-dozen people were arrested and 11 police officers injured, including a broken jaw and dislocated shoulder. Five officers were taken to hospitals. Police said that 10 businesses were damaged. Protesters also broke a window and spattered red paint on the home of St. Louis Mayor Lyda Krewson. The eruption late Saturday followed a day of noisy but non-violent demonstrations at suburban shopping malls. Protesters shouted slogans such as “black lives matter” and “it is our duty to fight for our freedom” as they marched through West County Center mall in the city of Des Peres, west of St. Louis. A group also demonstrated at Chesterfield Mall in the suburbs and at a regional food festival. Organizers hoped to spread the impact of the protests beyond predominantly black neighborhoods to those that are mainly white. Smith’s death is just one of several high-profile U.S. cases in recent years in which a white officer killed a black suspect, including the 2014 killing of Michael Brown in nearby Ferguson that sparked months of angry and sometimes violent protests. Stockley shot Smith after the suspected drug dealer fled from officers trying to arrest him. Stockley, 36, testified he felt he was in danger because he saw Smith holding a silver revolver when the suspect backed his car toward officers and sped away. Prosecutors said Stockley planted a gun in Smith’s car after the shooting. The officer’s DNA was on the weapon but Smith’s wasn’t. Dashcam video from Stockley’s cruiser recorded him saying he was “going to kill this (expletive).” Less than a minute later, he shot Smith five times. Stockley’s lawyer dismissed the comment as “human emotions” during a dangerous pursuit. St. Louis Circuit Judge Timothy Wilson, who said prosecutors didn’t prove beyond a reasonable doubt that Stockley murdered Smith, said the statement could be ambiguous. Stockley left the force in 2013 and moved to Houston. Sign up for the AP’s weekly newsletter showcasing our best reporting from the Midwest and Texas: http://apne.ws/2u1RMfv.